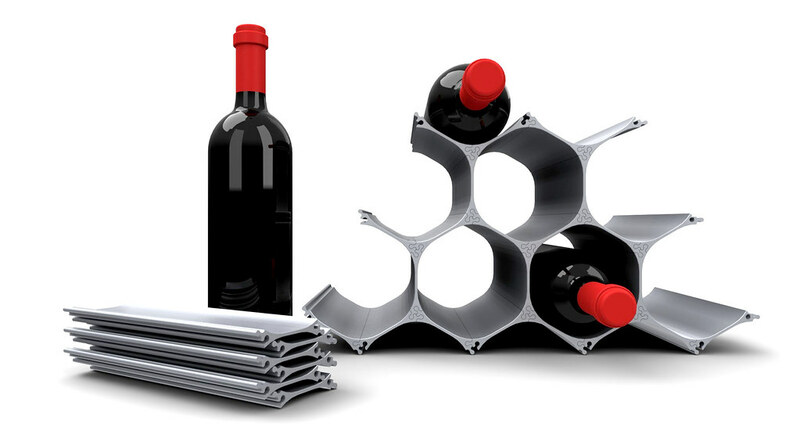 Made in America from recycled aluminum, the WineHive is an eco-friendly honeycomb wine rack, with infinite add-on capability. Now also available for pre-order at TinyLightbulbs.com! Uncrate: "...the trouble with most designer wine racks is their finite size...WineHive avoids this situation with an eco-friendly design that uses identical recycled aluminum strips to form infinitely expandable honeycomb structures...securely hold your vino while adding a bit of organic style to your kitchen or bar..."
Inhabitat: "...WineHive is a brilliant, simple idea for an eco-friendly wine rack...the organic framework of the WineHive provides perfect spots to hold the wine collection of an aspiring aficionado, and the completed set is a chic piece of contemporary design..."
The Awesomer: "...create just the right size bottle rack, forming perfect honeycomb shapes as you stack them higher and wider..."
Cool Material: "...stylish and affordable...infinitely expanding wine rack for your sophisticated booze..."
Oh Gizmo! : "...a really clever product...that happens to look quite snazzy as well..."
The Elevated Standard: "...by far the most beautiful and well designed wine storage solution..."
Gear Culture: "...sleek, stylish, and sturdy; it will bring you many years of enjoyment..."
WhatTheCool: "...not only be used for wine, but other drinks as well..."
Take My Dough: "...elegantly and functionally displays collections of wine...the expandable nature of the product makes it a perfect gift..."
My Spy: "...a stylish and more affordable way to display your collection...don't need to make a guess now as to how big your collection will become..."
Cool Business Ideas: "...simply slide panels into each other and voilà. No tools, no sweat, no manuals to read..."
Shoebox Dwelling: "...accommodate a wine collection of any size and fit in any space..."
Wordless Tech: "...the most beautiful and well designed...the expandable nature of the product makes it a perfect gift..."
Dormslate: "...the classiest way to store and display your liquor collection..."
Frat Fury: "...the answer to all your space and limited wine rack problems...expandable, organic, and simplistic..."
Trend Hunter: "...very simplistic and modern...any bottle collector may want to invest in this..."
Joe's Daily: "...the ideal addition to your kitchen or dining room..."
Swag So Fresh: "...building out an entire cellar is not practical for most of us, but the WineHive is definitely almost as cool..."
Design You Trust: "...grow with your collection...showcase your bottles in several different ways..."
Job Trakr: "...if you are a stylish wine connoisseur, this is a product worth taking a look at..."
Moco Loco: "...a pleasingly simple invention..."
Rager Life: "...a modern minimalist wine rack..."
Purity: "...perfect for kitchens, dining rooms, bars, and more!" Vincent & Caroline: "...an amazing wine rack..."
Flippies: "...lite, sturdy, fully collapsible and ships flat..."
Cool Quirks: "...the design is elegant and practical; and unlike the traditional racks it is easy on the pocket..."
Hometone: "...absolutely organic in nature..."
Firm Nine Design: "...a great product that is both design and eco conscious..."
Tech Trend 24: "...a really clever product..."
Keetsa: "...the familiar shape of a hive whose spaces are perfect for placing those usual wine bottles..."
Inspiration Exhibit: "...super minimal in appearance and very attractive..."
The WineHive is made with just a single part, that repeats itself to form an infinite array of honeycomb structures. It can be customized to fit your growing bottle collection. 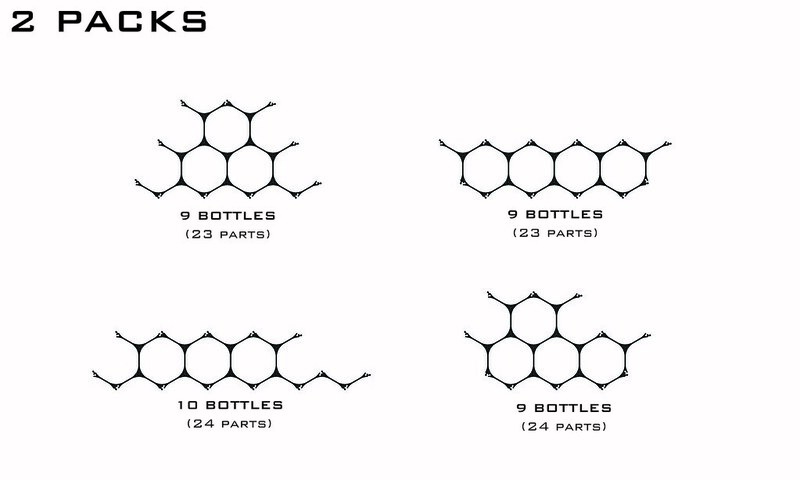 A WineHive "pack" consists of 12 parts. 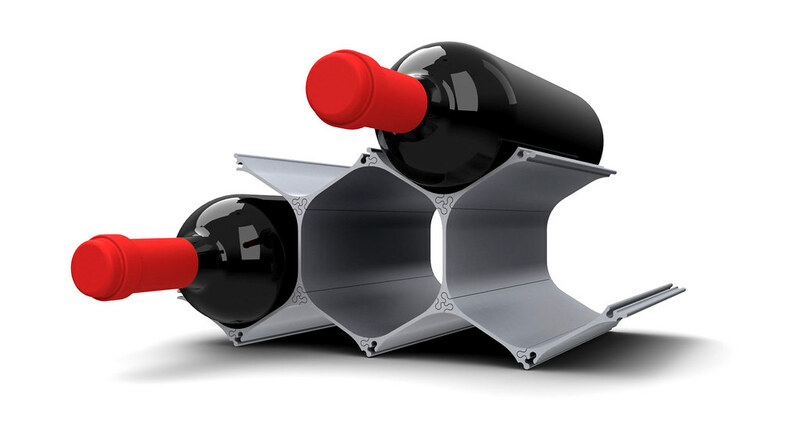 It can form a 5 bottle wine rack (above), or combine with other packs to form larger configurations. 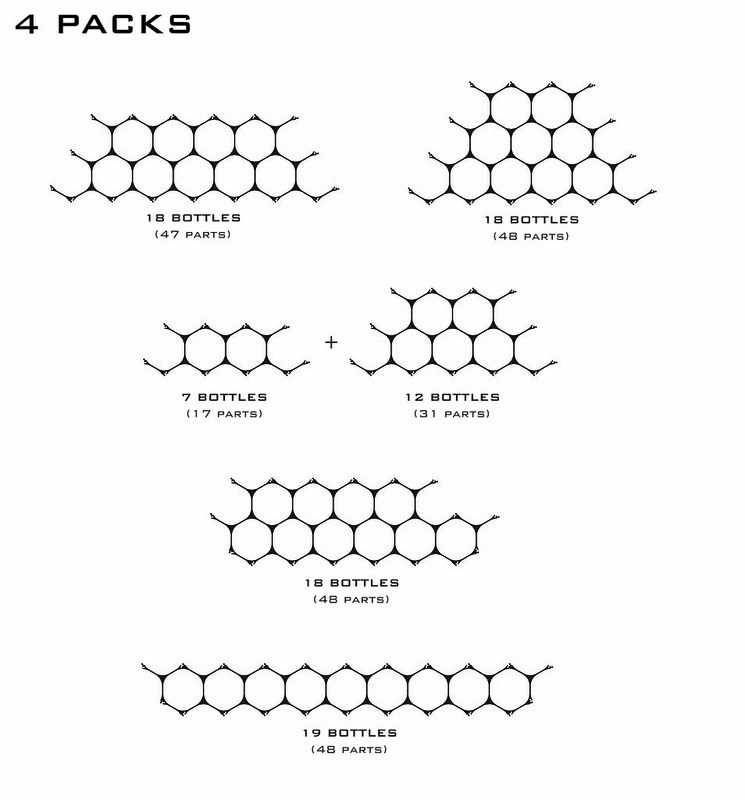 The more packs you have, the more configurations you can make. A KickStarter exclusive, the Table Runner WineHive (above and below) displays your favorite bottles on your dining table, or starts a mini hive anywhere you choose. 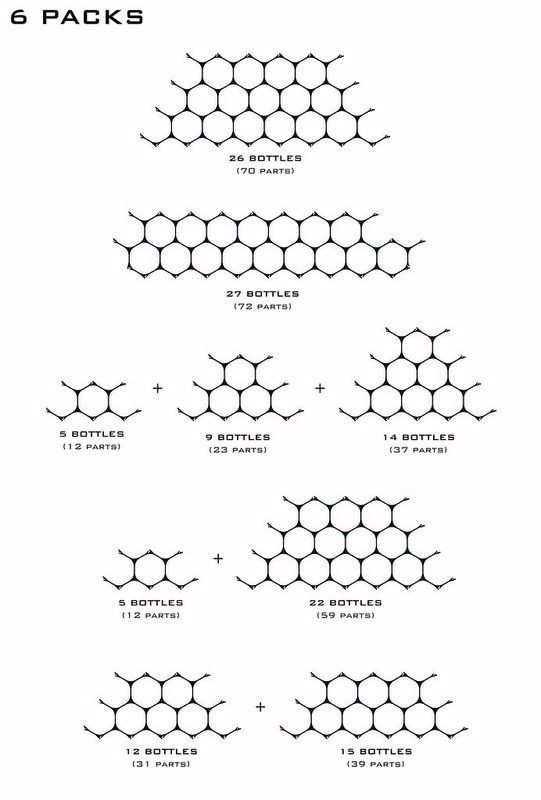 Stacks up to 6 bottles. 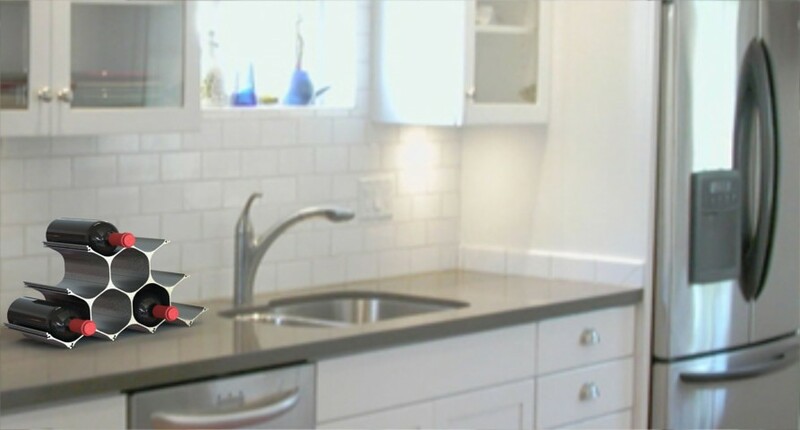 The WineHive has a high-end Satin Aluminum finish, which looks great in today's kitchens, bars, and restaurants. It also packs flat for efficient shipping. 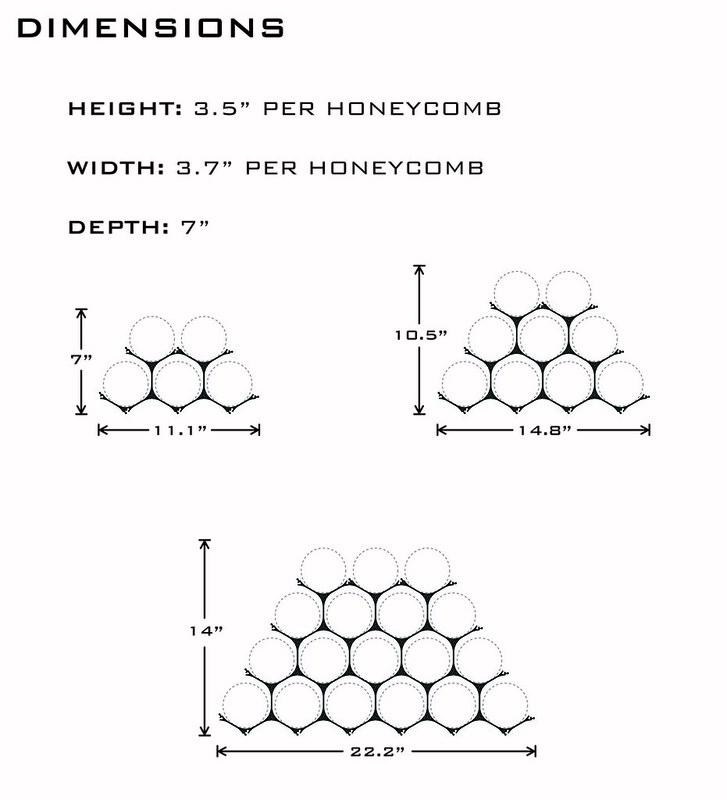 With your help, I can finance the tooling, first production run, and packaging of the WineHive. In return, you can pre-order the WineHive at an exclusive KickStarter discount, as well as help bring an American designed and manufactured product to market. Special thanks to Patrick Calderon with SiMedia. Patrick is a marketing expert that helped tremendously with social media and press releases. And of course, thanks to EVERYONE who backed the WineHive and helped spread the word. Couldn't have done it without all of you! 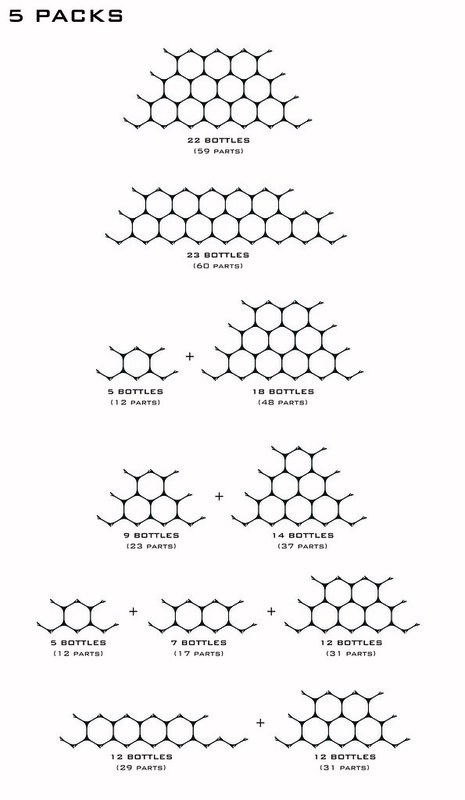 HALF PACK: (KickStarter EXCLUSIVE) 1-6 bottle "TableRunner" WineHive (1/2 pack). Includes shipping within USA. Please add $8 for Canada or Mexico, and $12 for International. This is a KickStarter EXCLUSIVE, and will not be available for retail. STARTER PACK: 5 bottle WineHive (1 pack). Includes shipping within USA. Please add $8 for Canada or Mexico, and $12 for International. If this project is funded, the online retail price will be $50. DOUBLE PACK: 9-10 bottle WineHive (2 packs). Includes shipping within USA. Please add $16 for Canada or Mexico, and $24 for International. If this project is funded, the online retail price will be $100. 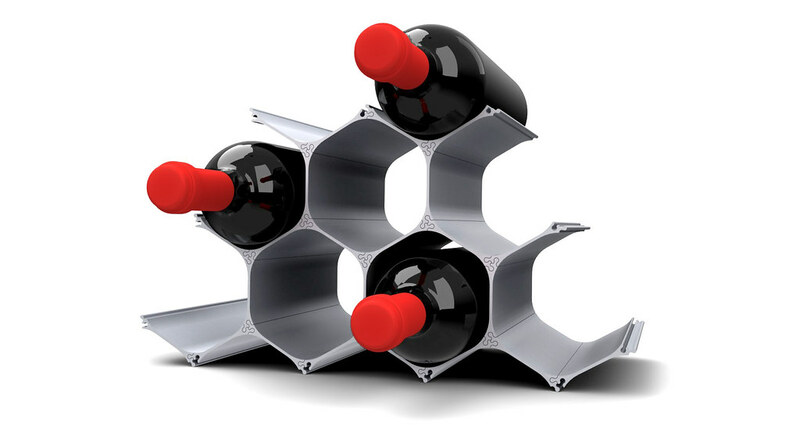 QUAD PACK: 18-20 bottle WineHive (4 packs). Includes shipping within USA. Please add $23 for Canada or Mexico, and $38 for International. If this project is funded, the online retail price will be $200. FAMILY PACK: 35-40 bottle WineHive (8 packs). Includes shipping within USA. Please add $26 for Canada or Mexico, and $47 for International. If this project is funded, the online retail price will be $400. 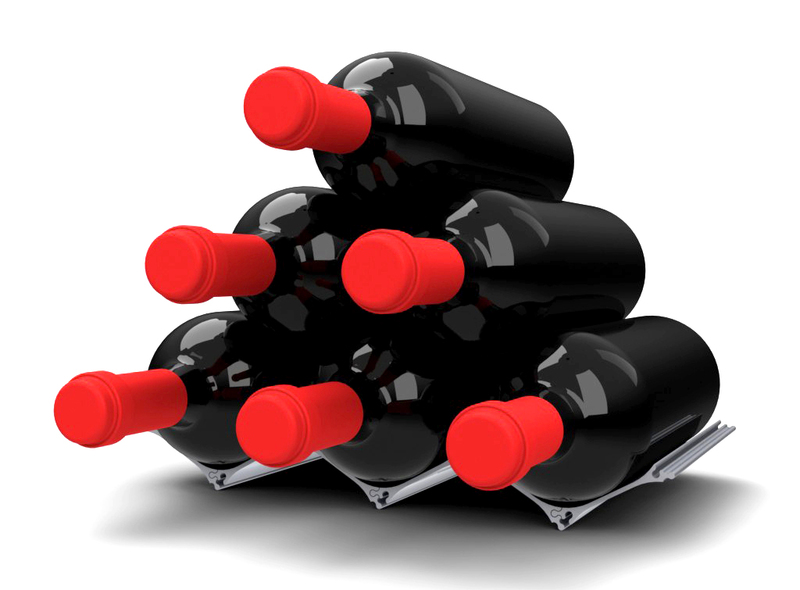 WINO PACK: 60-70 bottle WineHive (14 packs). Includes shipping within USA. Please add $45 for Canada or Mexico, and $75 for International. If this project is funded, the online retail price will be $700. PRO PACK: 130-150 bottle WineHive (30 packs). Includes shipping within USA. Please add $100 for Canada or Mexico, and $179 for International. If this project is funded, the online retail price will be $1,500. SUPER PACK: 350-400 bottle WineHive (80 packs). Includes shipping within USA. Please add $260 for Canada or Mexico, and $470 for International. If this project is funded, the online retail price will be $4,000. 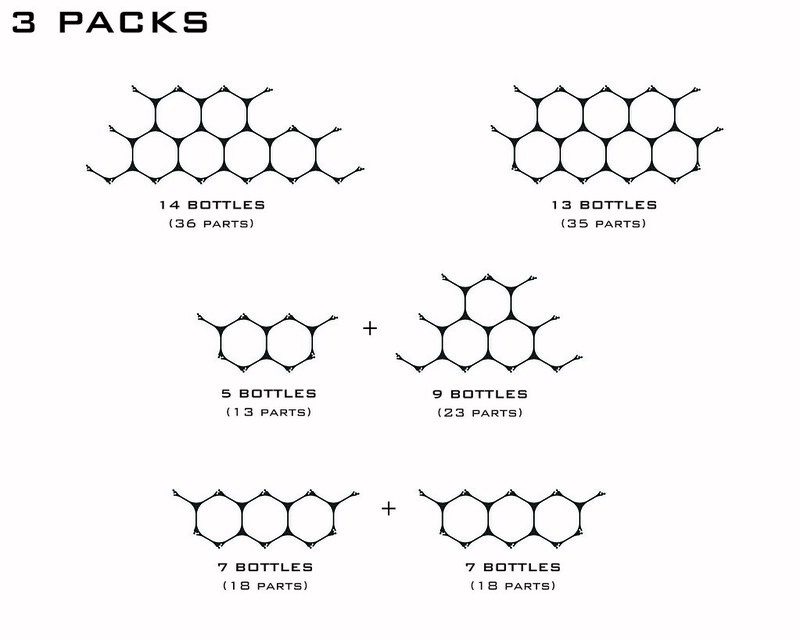 INVESTOR PACK: 700-850 bottle WineHive (170 packs). Includes shipping within USA. Please add $562 for Canada or Mexico, and $1,011 for International. If this project is funded, the online retail price will be $8,500.